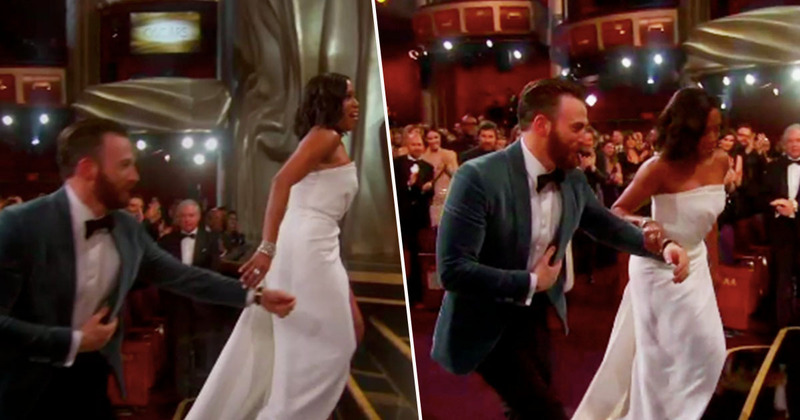 Chris Evans channeled the Cap at the Oscars last night when he lent his arm to Oscar-winning actor Regina King on stage after her dress gave her a bit of grief. King, who won Best Supporting Actress for her outstandingly emotional performance in If Beale Street Could Talk, was sitting on the front row of the Dolby Theatre in Los Angeles with her mother when she was announced victorious. She appeared to get her white gown stuck momentarily. While her mum adorably fluffed the train, Chris Evans literally jumped out of his seat to lend King an apparently welcome arm. The main headline is, obviously, Regina King’s amazing performance and her deserved gong. The 48-year-old actor also won the Golden Globe earlier this year, making the Oscar he seventh award for If Beale Street Could Talk. Set in early-1970s Harlem, the Barry Jenkin directed film is, according to Rotten Tomatoes, a ‘timeless and moving love story of both a couple’s unbreakable bond and the African-American family’s empowering embrace’. It’s told through the eyes of 19-year-old Tish Rivers (played by screen newcomer KiKi Layne) whose fiance Fonny (Stephan James) is arrested for a crime he did not commit. Fan favorite Bohemian Rhapsody was a big winner, taking home four trophies, including a Best Actor win for star Rami Malek. But it was Peter Farrelly’s Green Book and Alfonso Cuarón’s Roma which came away with the highest honors. The former took Best Picture, Best Supporting Actor, and and Best Original Screenplay, while the latter took Best Director, Best Cinematography, and Best Foreign Language Film. Meanwhile, Chris Evans, 37, walked away with the Internet Jury having voted him the best gentleman of the evening for his little gesture for King. You can watch King’s reaction to be announced the Oscar-winner by the trifecta of Tina Fey, Amy Poelher, and Maya Rudolph via the broadcaster ABC. She was up against Rachel Weisz and Emma Stone (The Favourite), Amy Adams (Vice) and marina De Tavira (Roma). She also thanked the Rivers family and her mum for teaching her the spirituality with which she approached her work and life in the emotional speech – as well as her ‘sisters in art’.